Dietrich Bohnhorst's entertaining, funny and practical guide for every game angler. This DVD is a must for every fisherman who wants to learn the delicate art of flytying. Dietrich's enthusiasm for fishing shines as he methodically guides the fishing fraternity through the complex task of making a fly. 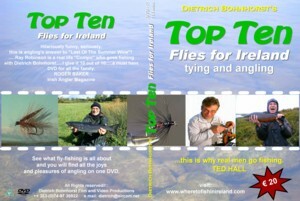 Punctuated throughout this DVD is the success rate of choosing the right fly for each occasion. The beautiful scenery enhances the pleasure of this film, as does the dry humour of his eccentric English friend "the great Raymondo". Watch as they tramp the landscape, dressed as if extras in Monty Python's Quest for the Holy Grail, (which in a sense they are, in a fishy sort of way). Hilariously funny, seriously, this is angling's answer to "Last Of The Summer Wine"! .....Ray Robinson is a real life "Compo" who goes fishing with Dietrich Bohnhorst.....I give it 10 out of 10.....a must have DVD for all the family. ...was very impressed by the DVD. Very good filming.